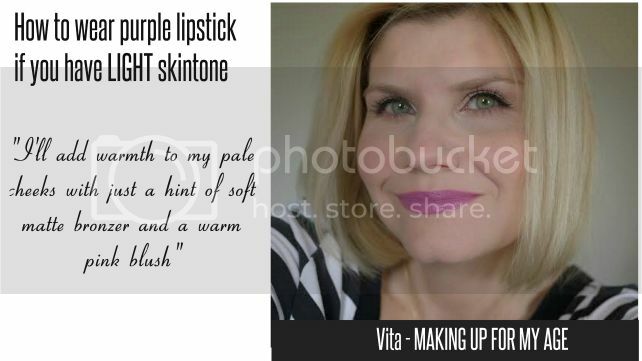 Vita from Making Up For My Age is here to give you her tips for wearing purple lipstick if you have LIGHT skintone. I look for a purple lipstick shade with a bit of life and vibrancy to it - I look for purples with pink or red undertones. I avoid brown undertones at all costs because they look too dead against my skin and drain the colour from my face. I'll add a bit of warmth to my pale cheeks with just a hint of soft matte bronzer and a warm pink blush. When it comes to eyes I think you can go with whatever normally suits you and match or contrast with your lip shade. I've gone for a classic look here with cool neutral beige and black liner to keep the emphasis on my lips. 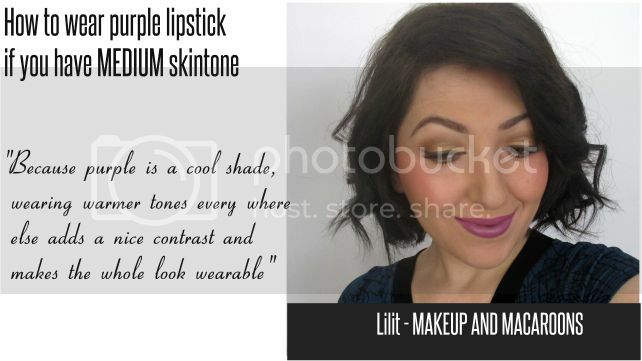 Lilit from Makeup and Macaroons (that's me!) has this single tip for those with MEDIUM skin tones. I keep my eyes and face warm, so warm golden browny tones on my eyes and a peachy blush or bronzer on my cheeks. Because purple is a cool shade, wearing warmer tones every where else adds a nice contrast and make the whole look wearable. 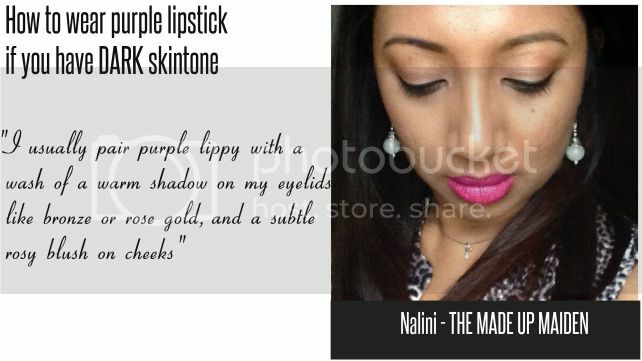 We have the gorgeous Nalini from The Made Up Maiden who makes purple look both sultry yet fresh on her skintone. This is what she has to say about wearing purple. Purple lipstick can be a tricky shade to wear so I like to keep the attention on my lips and tone down the rest of my face. I usually pair purple lippy with a wash of a warm shadow on my eyelids, like bronze or rose gold, and a subtle rosy blush on cheeks. I also like a dash of black liner, mascara and groomed brows to help pull the look together. Keep the rest of your makeup warm toned. That's it. They key to wearing purple on your lips. So ladies, stop being afraid of purple and start experimenting as it's really not that difficult a shade to wear. Vita & I are both wearing MAC Up The Amp (notice how different it looks on each of us? ), and Nalini is wearing Maybelline Colour Sensational lipstick in Hot Plum. 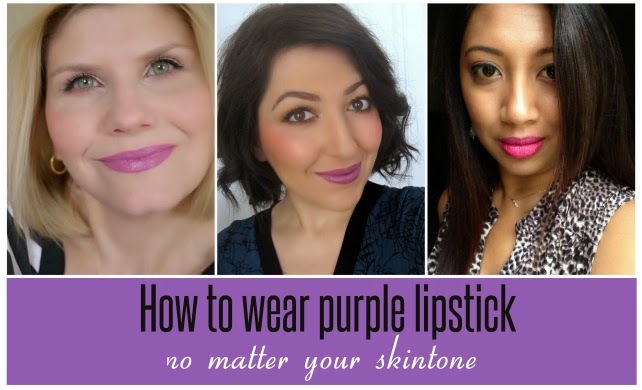 Do you wear purple lipsticks? What do you think of our tips? Do you have other tips to offer us? I've never worn purple lipstick, I'm a bit of a wuss like that! I might try and find a cheap one to experiment with, looks awesome on you! Oh you should definitely try it! We have similar colouring so maybe try MAC UP The Amp, you'll love it! I love those shades on others but somehow I can't get away with wearing deeper shades like that. You're lucky if you can wear them! I love the purple lipstick trend! My favorite one is Rimmel Moisture Shine in Vintage Pink. Cheap and beautiful color and formula. Oooh I haven't tried that one, I'll check it out next time I see a Rimmel counter. This post it's great because purple lipsticks are really tricky for me, I'll follow these tips. Thank you! I'm following you blog now, hope you like mine and do as well.